Are we really getting a clean Ganga by 2019? We have already lost 30 years after the launch of the first Ganga cleaning programme. It is time to take strong and quick actions on the ground. The Narendra Modi government will be completing two years soon. But the question that is uppermost in the minds of environmentalists as well as pious Hindus is whether it is taking enough initiative to clean the river Ganga? By now, it is well-known how, in 2014, the then-prime ministerial aspirant Narendra Modi tried to portray the cleaning of Ganga as the top priority of his party. Hopes were especially high when the Central government, through India’s first Ganga minister Uma Bharati brought out plans to clean the national river, with 2019 set as the deadline. The first year only saw meetings and plans. The ministry called several national and international experts to get ideas on making the Ganga clean. In its second year, the government signed a Memorandum of Understanding with Germany (German International Cooperation) for cleaning the Ganga. Also, the Union Ministry of Water Resources, River Development & Ganga Rejuvenation (MOWR) tried to meet three points in its thirteen point agenda—of cleaning the river surface and ghats, creation of a Ganga task force and creation of Ganga grams (model villages) along the main stem of the Ganga. In April, 2016, Bharati even announced that the results of the first phase of Ganga cleaning would be seen in October this year. Technical bids have been invited for surface and ghat cleaning. Not only this, hype has also been created around launching the Ganga gram projects. What are the Ganga gram yojana (projects)? Basic sanitation and toilet facilities will be provided for more than 1,600 villages along the Ganga with support from the Ministry of Drinking Water and Sanitation. In the first phase, around two hundred villages will be taken up as model Ganga grams based on the recommendations of the concerned local authorities—they should be of historic, cultural, tourist and/or religious importance. The list includes all 78 villages in Sahebganj district, Jharkhand and 128 villages from Uttarakhand, Uttar Pradesh, West Bengal and Bihar. • Promote better sanitation practices in the villages through information, education and communication activities. In January, the first set of model villages was launched in Pooth village (Hapur district, Uttar Pradesh). In May, the second set was launched in Sahibganj district, Jharkhand. The Sahibganj project is coming up in partnership with the United Nations Development Programme (UNDP) at a cost of USD1.6 crore and the MOWR is contributing almost 91 per cent of the amount. There are around 1,651 gram panchayats along the Ganga which need immediate care in terms of sanitation. 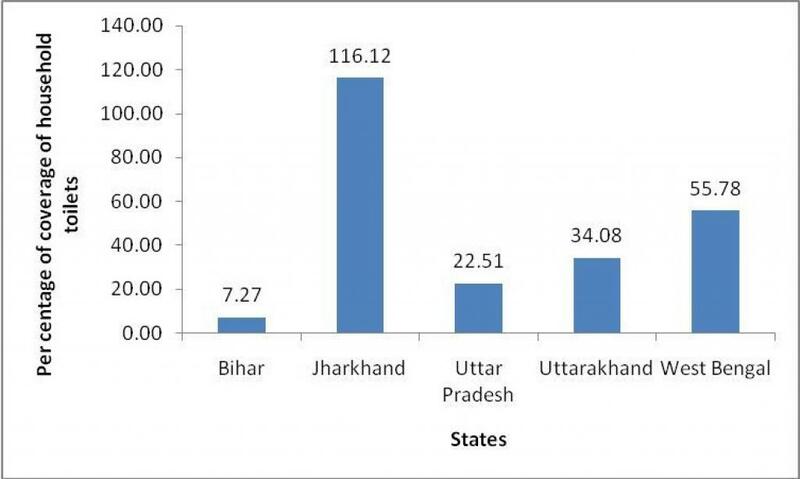 The individual household toilet coverage in these gram panchayats is very low except in Jharkhand (See graph). Can we make the two ends meet? In my personal interaction with Minister Bharati, I understood that tackling of actual pollution in the river will take time. How much time? May be the work will start after a year—it will require a bidding process which itself will take a year, says the minister. Meanwhile, the Central government is focussing on these Ganga grams which they think can be done easily. The villages in Uttar Pradesh, Uttarakhand, Bihar and West Bengal where these model projects are planned, have not attained open defecation free status till date. The solid-liquid waste management also needs care. This means sewage will continue to flow into the Ganga until the villages are fixed. So, on the one hand, we have to wait to clean the existing pollutants from the river and on the other hand, the villages along the Ganga will continue to add their sewage. For example in Bihar, the coverage of individual household toilets should be done at a very fast rate and the coverage needs to be almost at the rate of 493 toilets per day to meet the target by 2019. However, this does not ensure usage of toilets—not even in the well-covered gram panchayats of Jharkhand. We have already lost 30 years after the launch of the first Ganga cleaning programme. It is time to take strong and quick actions on the ground. Only cleaning the surface of the river and ghats is also not enough. The big contributors of the pollution—urban areas and industries—also need immediate care. We really need actual action.